In a medium bowl, combine Cheddar cheese and cream cheese and set aside. In a small bowl, combine pickle, mustard, and dill and set aside. Arrange bread on a work surface. Spread cheese mixture on one side of all 8 slices. Spread pickle mixture on 4 slices, on top of cheese mixture. 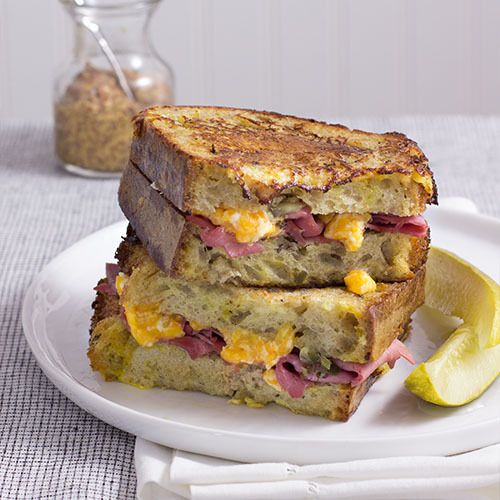 Arrange corned beef on top of pickle mixture, keeping it slightly away from edges of bread, then top with remaining 4 slices of bread, cheese side down. Press edges of top slices and bottom slices together to help seal. In a shallow bowl or pie pan, combine eggs, milk, garlic salt, and pepper. In a very large skillet over medium-low heat, melt butter. One at a time, carefully dip sandwiches into egg mixture, turning to coat both sides. Transfer to the skillet and cook until golden brown, 3 to 4 minutes per side.